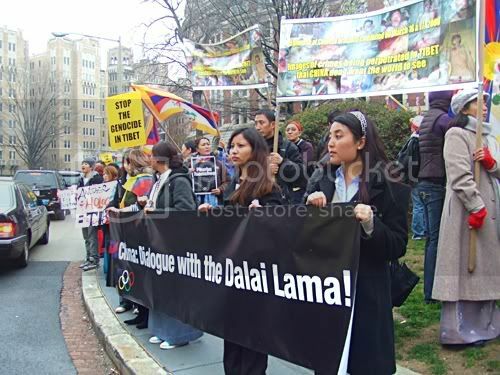 http://www.slccolorado.org/storage/proscar/ Please see the update at the end of this diary, with letters to the Chinese people and the world from His Holiness the Dalai Lama. 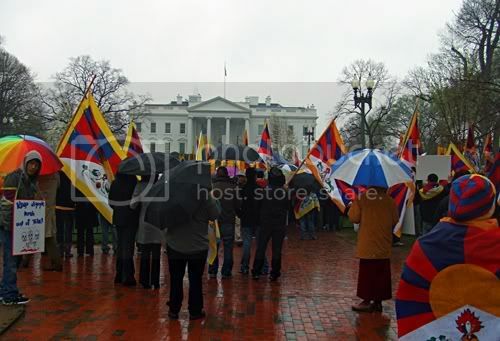 accutane generic versions On Monday, March 31, a large group of Tibetans, Americans of Tibetan ancestry, and other American supporters gathered at Lafayette Park outside the White House in Washington, DC to ask President Bush to make a statement for human rights and refused to attend the opening ceremonies of the Beijing Olympics in protest of Chinese government oppression of Tibet. acquistare viagra generico 100 mg a Torino I have been very moved by the mostly nonviolent struggle of the Tibetans to regain their freedom, and by the strength and compassion shown by the Dalai Lama in urging them to maintain nonviolence at all times. I decided it was important to go and stand in solidarity with them. This is my report on the event. 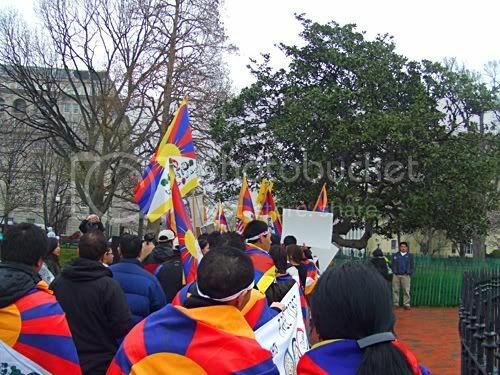 The plan for the day was to meet at Lafayette Park, hear some speakers, and then march up Connecticut Avenue to the Chinese Embassy, which is just before the bridge that goes over Rock Creek Park. If you’re not familiar with DC, I can tell you this is a fairly long walk. I didn’t take any notes, but I did take a lot of pictures and a few videos, so this will be a very visual report. 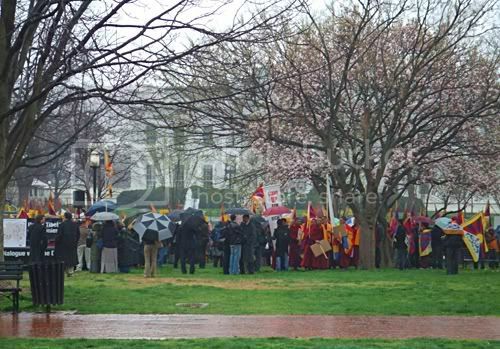 As I approached the gathering, a small cluster of Tibetan monks stood together and apart from the crowd with their banners. Maybe they were praying, or maybe they were just planning their involvement in the event. I was happy to see them. Buddhist monks always seem to have such a nice calm energy. I am slightly mystified by why I like them so much. Perhaps it’s because they preach compassion and seem to do an admirable job of practicing it too. I just know that I feel like my heart opens just a little bit more every time I see Tibetan monks. I was saddened to see the messages on the banners they carried. I stood with the rest of the crowd and chanted the slogans with them as best I could. Sometimes I had a little bit of trouble understanding what they were saying, either because the person leading the chant was shouting a little too loudly for his voice, or because of the accents and the general confusion of crowd noise. I wasn’t there too long before the crowd started a mass movement in one direction, so I followed them, and we gathered around a stage that I hadn’t noticed before. The crowd around me was very colorful, or perhaps I should say very united in their color choices. 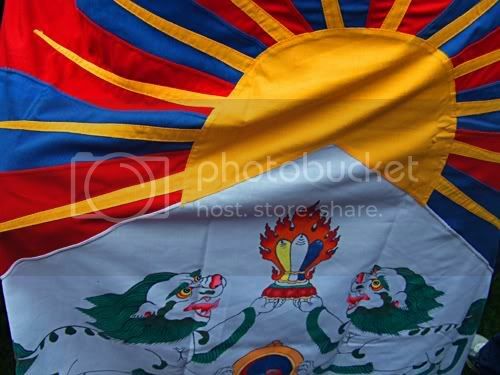 Many of them carried or wore the flag of Tibet, often draped around their shoulders like a cape. 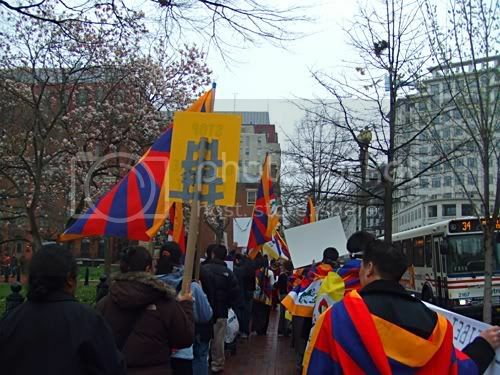 The first speaker described the current situation in Tibet, in which the exiled Tibetan government says there have been at least 140 people killed. The Tibetan government has released the names of 40 of them, and many people in the crowd held signs with these names on them. 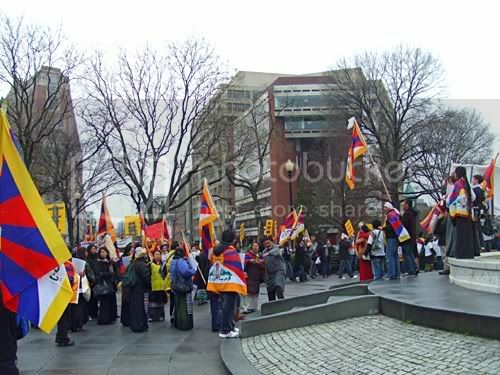 Several other speakers followed, many of them from various Tibetan organizations in the United States. There was also a speaker from Amnesty International. U.S. Representatives Abercrombie of Hawaii and Kucinich of Ohio also spoke. Representative Abercrombie had been to Dharamsala, India with the congressional delegation led by Nancy Pelosi to meet with the Dalai Lama. Representative Kucinich had also met with the Dalai Lama when he was in the United States to receive the Congressional Medal of Honor, and he spoke about that meeting and also the great opportunity for the world and for China to learn nonviolence and compassion from the Tibetan people. I have to apologize for the quality of my videos. I was standing on the side of the stage, and often could not see the speakers. Anyway, here is at least a partial picture of Dennis as he left the stage. 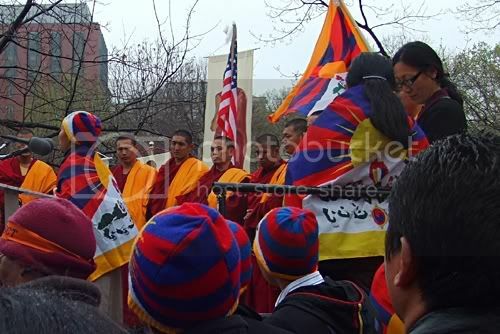 A few times the speakers spoke in Tibetan, and there was some singing in Tibetan, including what I think they called the Tibetan National Uprising Song. There is a portion of the end of that in the first video. 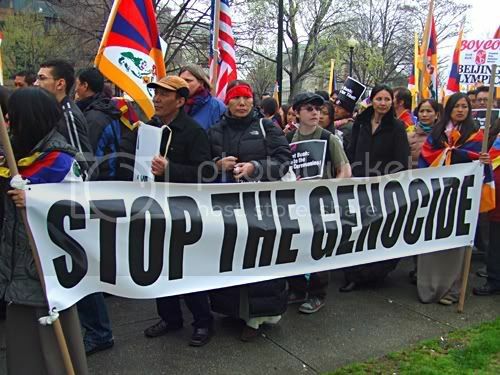 Although I didn’t understand everything that was said, it is very clear that a harsh injustice is being done to these people and their friends and families in Tibet. Several times the speakers brought me to tears. 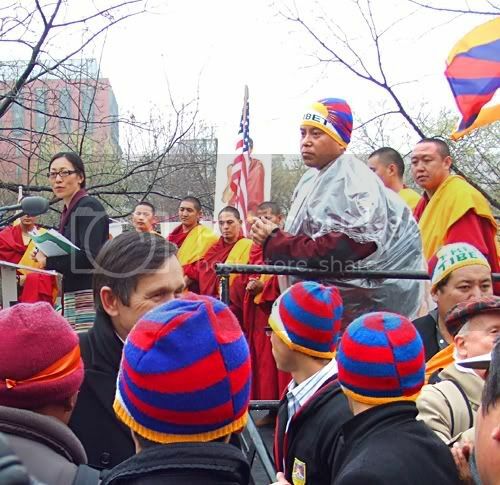 Some of the speakers mentioned the missing Panchen Lama, who disappeared when he was just a young boy and is believed to be a political prisoner in China. There is also a serious environmental concern here, because China is doing a lot of mining in Tibet and is dumping nuclear waste in Tibet, according to some of the speakers at the event. If you saw Al Gore’s An Inconvenient Truth, then you may remember that 40% of the world’s water comes from the Himalayas. What China is doing in Tibet is polluting the water at the source for many people that live downstream. 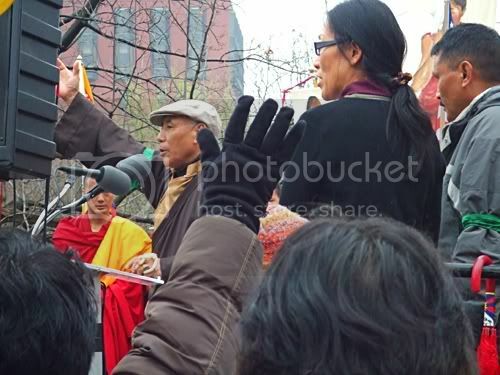 One of the speakers was an emissary from the Dalai Lama, who reminded the crowd that Tibet has the world’s sympathy because of their nonviolent approach, and urge them to have patience and maintain nonviolence at all times. 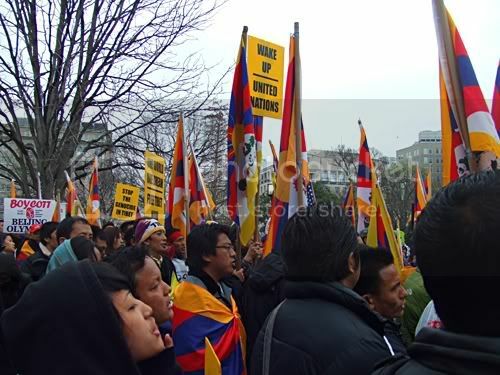 He also spoke about encouraging signs in Europe and the United States that the world may be ready to help Tibet. I didn’t catch the man’s name, but the Washington Post says he was Lodi Gyaltsen Gyari. 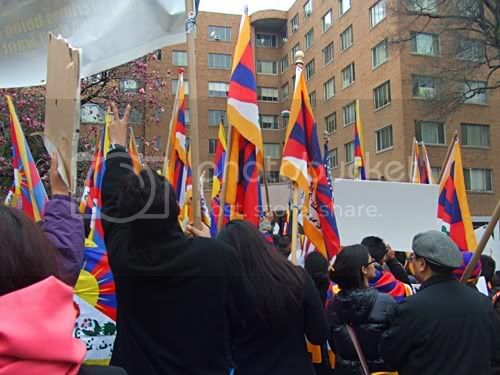 After the speeches were over, people began to line up for the march up Connecticut Avenue to the Chinese Embassy. The monks led the way. There was more chanting of slogans as we walked in our long procession. Many people driving by honked at us in support. 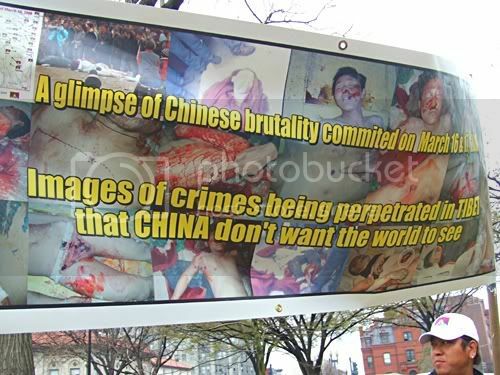 Some people carried banners that bore photos of recent Chinese atrocities. We stopped for a rest when we got to Dupont Circle, probably partly because it was a very visible location for people driving by, but also because it was time for lunch. This may be the only big protest I’ve ever been to where the organizers fed everyone. How cool is that? They really took care of us. It was only bread, granola bars, water, and a bit of chocolate, but people need something when they are marching for that long, and it was kind of the event organizers to think of that. 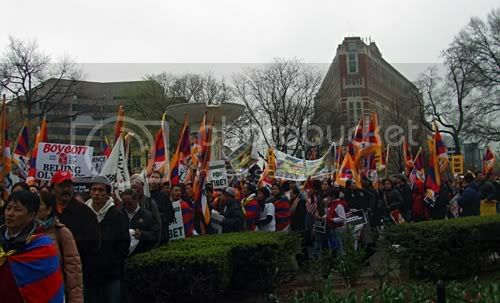 Soon it was time to continue toward the Chinese Embassy. We arrived at the embassy and gathered on to a little patch of garden in front of it. The big colorful crowd continued to chant slogans as a few people watched us from the embassy windows, and passing cars honked in support. 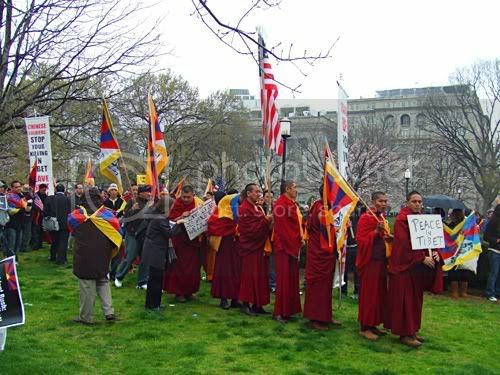 As the monk’s banner in that last photo points out, there is an issue about the Olympic torch going through Tibet. 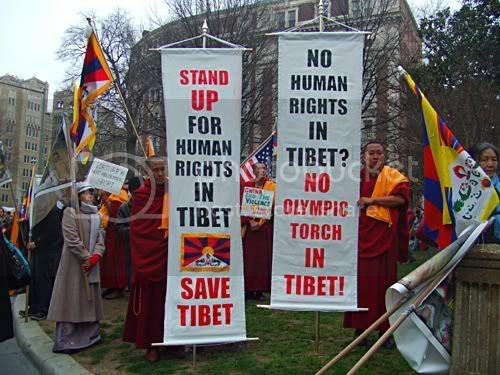 Right now, China plans to have the Olympic torch go through Tibet, which is a slap in the face of the Tibetan people while they are living under oppression. The Olympics are supposed to be a symbol of international cooperation and friendship. 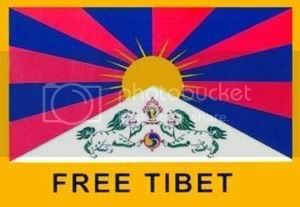 To have it run through Tibet while Tibet is being brutally oppressed by a foreign dictatorship is not in the Olympic spirit, and it is an insult to the Tibetan people because it ignores the fact that they are not free. 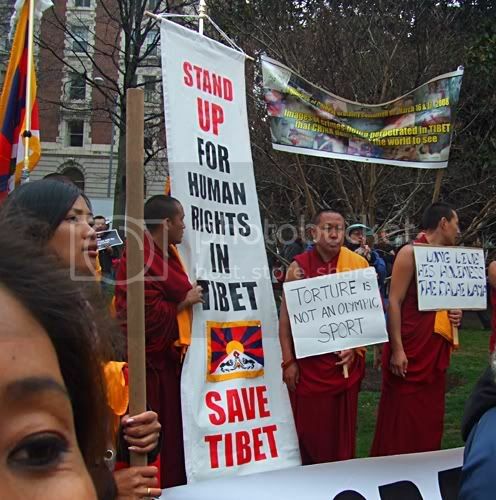 Please help by signing this petition to keep the Olympic torch out of Tibet. 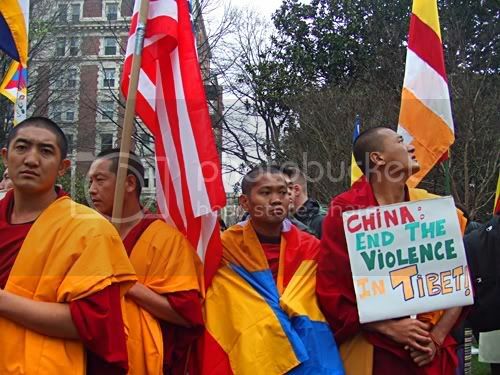 The Dalai Lama has issued letters to the Chinese people all over the world, and to the world and its leaders. 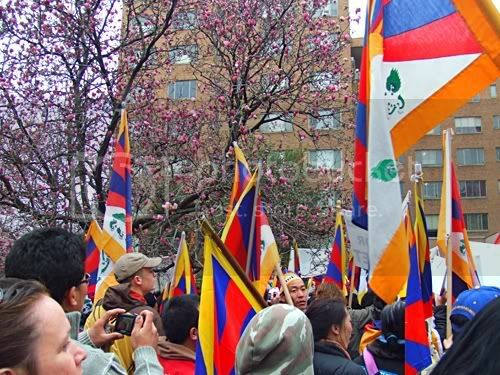 The letter to the Chinese people express is the Dalai Lama’s willingness for Tibet to remain part of China, as long as the grievances of the Tibetan people can be addressed. It shows great compassion to the Chinese people. I have appealed to the leadership of the PRC to clearly understand my position and work to resolve these problems by “seeking truth from facts.” I urge the Chinese leadership to exercise wisdom and to initiate a meaningful dialogue with the Tibetan people. I also appeal to them to make sincere efforts to contribute to the stability and harmony of the PRC and avoid creating rifts between the nationalities. 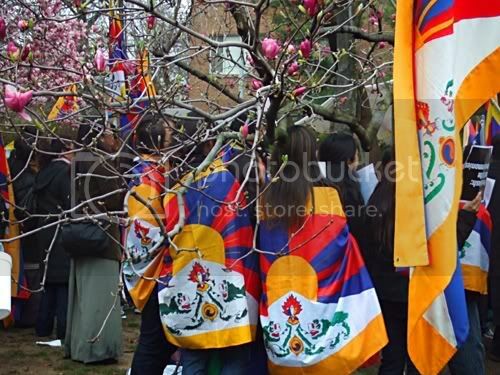 The state media’s portrayal of the recent events in Tibet, using deceit and distorted images, could sow the seeds of racial tension with unpredictable long-term consequences. This is of grave concern to me. Similarly, despite my repeated support for the Beijing Olympics, the Chinese authorities, with the intention of creating a rift between the Chinese people and myself, the Chinese authorities assert that I am trying to sabotage the games. I am encouraged, however, that several Chinese intellectuals and scholars have also expressed their strong concern about the Chinese leadership’s actions and the potential for adverse long-term consequences, particularly on relations among different nationalities. This is a very long letter, but it is worth reading in full. The letter to the world explains what the Dalai Lama is asking of each of us and our leaders. … great pictures and information! I hope that this situation can be resolved without any more human suffering. There is always a way towards peace. Buddhist monks always seem to have such a nice calm energy. I am slightly mystified by why I like them so much. Perhaps it’s because they preach compassion and seem to do an admirable job of practicing it too. I just know that I feel like my heart opens just a little bit more every time I see Tibetan monks. I was saddened to see the messages on the banners they carried. I was happy to hear that Kucinich and Abercrombie were there to speak, I’m looking forward to watching your videos once I get home tonight. 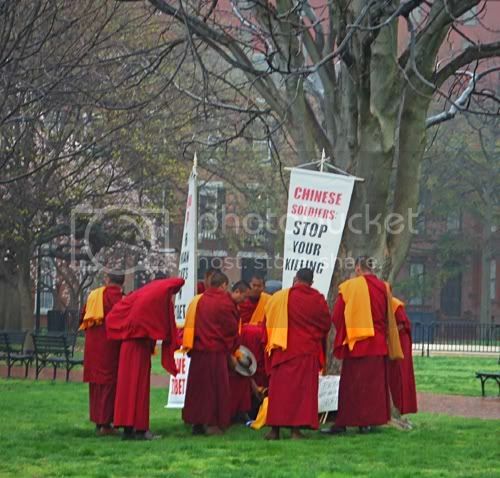 Please sign this Amnesty International petition for the release of 15 monks taken prisoner by the Chines Government.